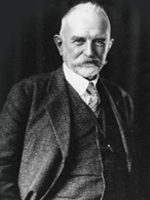 Few people were surprised that George Herbert Mead became a college professor. He was born to a Massachusetts family with a strong intellectual tradition, and both his parents were academics. His father was both a preacher and a teacher at a number of colleges, and his mother served for a decade as president of Mount Holyoke College. But Mead also had a hand in shaping his own life, rebelling against the strongly religious atmosphere of his home and community. After completing college, he restlessly traveled throughout the Pacific Northwest, surveying for the railroad and reading voraciously. He gradually settled on the idea of studying philosophy, an academic endeavor he pursued at Harvard and in Europe. Mead took a teaching position at the new University of Chicago. But his outlook still veered from the conventional. For one thing, he rarely published, going against a long-standing traditionamong academics. Mead’s reputation and stature grew only after his death, when colleagues and former students collected and published his lecture notes. For another,Mead drew together a wide range of ideas to help launch the new field of social psychology. Finally, never content with life as it was, Mead was an active social reformer. To him, the course of an entire society was as ongoing and changeable as the life of any individual. This insight follows from his basic contention: Society may have the power to shape individuals, but people also have the capacity to mold their society. Sources: Based, in part, on Coser (1977) and Schellenberg (1978).